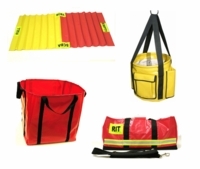 Here you will find a big variety of various carry bags for cribbing, tools, debris, hoselines. You will also find various mats for staging, RIT/FAST teams and SCBA staging mats. Many color varieties are avaialble as well as sizes.